The two questions are, of course, significantly different. Belief in Jewish guilt today for an event two thousand years ago is irrational, assuming a magical transmission of acquired collective culpability over many generations. On the other hand, belief in historical Jewish complicity in the Crucifixion is tantamount to belief in the accuracy of the New Testament, where crucial Jewish involvement in the Messiah’s death is amply documented. 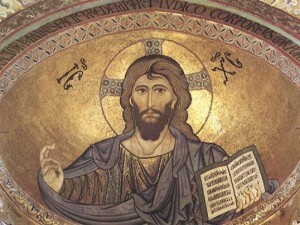 “He came unto his own,” the evangelist John wrote, “and his own received him not” (John 1.11). The nascent Christian Church, though comprised largely of Jews, believed that their anti-Christian compatriots had engineered Christ’s execution, and Christian writers recorded that belief for posterity. See especially 1 Thessalonians 2.14-16, which belongs to one of the earliest Christian texts, written independently of the gospel passion stories. In the gospels themselves Jewish leaders work for Jesus’ death, the Sanhedrin decides his fate, the Roman prefect Pontius Pilate reluctantly complies, a Jewish mob accepts guilt for the imminent deicide (Matthew 27.25), and Roman soldiers torment the Christian Son of God before crucifying him. The second question — the ADL’s question — could be rephrased: Do you believe the New Testament account of the Crucifixion? That was what the ADL were really asking. They were disappointed with the meager results from the previous ABC poll, and their own question was clearly designed to increase the number of respondents who would give the “wrong” answer, thus falling into the category “anti-Semite.” Thirty-nine percent of Americans define themselves as born-again Christians, most of them committed to the bible’s literal inerrancy, so the only real surprise from the ADL poll is the unexpectedly low number who unwittingly characterized themselves as anti-Semitic. If you’ve read the New Testament and if you believe that its account of Christ’s final days is more or less true, then (according to the ADL) you represent a troubling social problem. You have joined the ranks of irrational anti-Semites. Your religious beliefs require restructuring and your scriptures must be drastically rewritten to prevent others from succumbing to your error. The ADL were familiar with the ABC poll, which they refer to in their press release . They asked a much different question in order to generate artificially a larger number of Christian anti-Semites. Conservative Christians should ask themselves why a major Jewish organization would define anti-Semitism so broadly that anyone who believes in the historical accuracy of the gospels would fail their test. Why would the ADL define belief in the New Testament, which most Christians consider a divinely inspired document, as troubling evidence of anti-Semitism? Part of the answer lies in the character of minority politics. For all minority activists the best kind of racial hatred is a racial hatred you can falsely prove without having to experience the painful consequences that would occur if the hatred were genuine. For partisans of Black political causes the dragging death of James Byrd was the best evidence of alleged White racial hatred because it was so unrepresentative; most interracial crime , as all readers of National Vanguard know, is Black-on-White. From the propaganda onslaught surrounding Byrd’s death Black political activists acquired false proof of widespread White “racism” without having to endure the effects of actual racial hatred. If Byrd’s killers were indeed representative of a substantial proportion of Euro-Americans, life for Blacks would quickly become unpleasant. Since most Whites are non-racialist, proving White “racism” by such a wildly atypical interracial crime conferred on Blacks the political benefits of vicarious victimhood, free from even the threat of any real victimization. The ADL poll reflects a similar strategy and relies on a similar passivity in the people they are attempting to malign. The charge of anti-Semitism is potentially so devastating today precisely because the number of Whites who oppose Jewish power is, unfortunately, so low. The certainty that anti-Semitism is not only scarce but also widely reviled motivates Jewish attempts to manufacture bogus evidence of it and to expand the range of beliefs the label includes. We would find such calculated deception degrading; Jewish organizations think it’s simply clever politics. It is perfectly possible for a Christian to believe that Jews killed Jesus two thousand years ago and still have nothing but warm feelings for Jews today. Christians who accept the bible’s historical inerrancy are, as a matter of undoubted fact, the strongest supporters of Jews. Most are ardent Zionists, and most believe, wrongly but sincerely, that Christianity identifies Jews as God’s Chosen People (cf. Galatians 3.28-29). The ADL have consciously defined their most devoted admirers as though they were their worst enemies, secure in the knowledge that few of them will object. Pat Robertson will not renounce his Likudnik Zionism and his servile philo-Semitism just because the ADL has in effect called him an anti-Semite. Dr. Pierce once described the Jews as gamblers, never satisfied with success, always looking for risky new victories. The ADL’s recent polling legerdemain is a minor case in point. A reasonable Jew would be content with the routine repudiations of collective Jewish guilt for Christ’s death that now flow steadily from all mainstream Christian spokesmen, including Mel Gibson. But the Jewish gamblers at the ADL want much more: They want Christians to rewrite the New Testament, and they want them to feel guilty that they ever believed it in the first place.